That’s right, I made a bonafide vlog about why I art journal. There has been an awful lot of radio silence my end both on my youtube channel and here around and following the move and all the stressful stuff that has been going on in other areas of my life. Things have finally begun to settle down and what better way to celebrate than by pushing my boundaries a little bit more and actually videoing me talking rather than just my hands showing something off? The internet gave me a gift today, for all it’s faults it houses some real gems and today it was this quote. I’ve been writing a lot about change and transformation over the last few months because it has been so very prevalent in my life this year. I have been going through, what I described to my friend the other day as, a life overhaul. Now don’t get me wrong, it’s awesome. 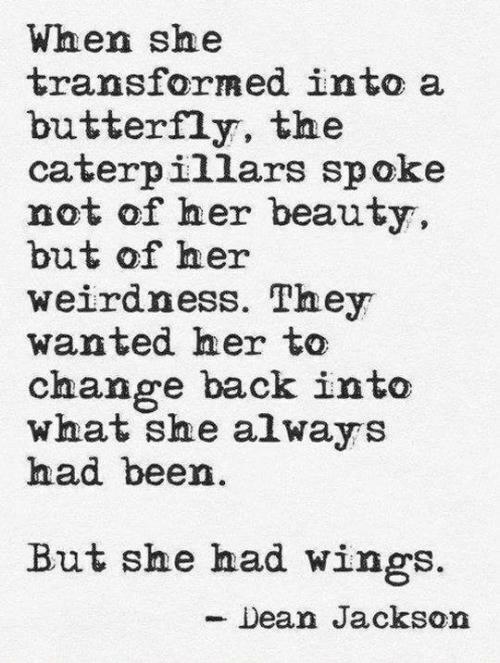 It didn’t feel awesome for ages, it felt terrible while I was going through the changes and uncertainty itself but like the butterfly that emerges from it’s cocoon, I’ve finally emerged from the other side feeling more able, strong, balanced and beautiful in and of myself. My friend told me that she felt that was a huge sign of my growth during this period and I think she’s right about that. I’m still me but a lot has changed about me at the same time. I have a whole new perspective on my life and what I want and need in it to the point that it has, at times, become clear that it’s something that hasn’t been welcomed by some of the people around me. I think that when you grow and change and begin getting things in order it can be scary and unsettling for the people around you if they’re not ready for change to happen to them as well. It’s a personal thing, it happens on our own timeline when it’s necessary for us and our lives individually. I catch myself when I’m talking to people to remind myself to be honest and not play down my situation to fulfil everyone’s thoughts of where in life they think I should be and frankly, it’s hurtful when a friend asks me why I’m not in a relationship with someone as if I should be aiming for that or why I have chosen to live and work creatively as an artist as though it’s never going to get me anywhere and never going to bring me success. I don’t believe that and most of all it does bring me success. Success to me is making it through the day happy and grateful for what I have and what I do. Having spent so long struggling with depression and being so close to giving up on life completely, doing something I love and that brings me so much happiness is a far greater success than trying to force myself to live a way that’s not right for me. People may not like the changes in my life, they might think that they have the right to look down on me for them or consider me an oddity for my choices but you know what? I’ve embraced them, accepted them and made them my own. I’ve made it through a difficult time and found my wings after the stifling stress, darkness and uncertainty of change in my very own cocoon. Be happy for me, now I can fly.